ILDA offers three courses covering laser safety for laser lightshows. The Laser Safety Officer course takes about eight hours; those who pass a test at the end will receive a Certificate of Completion. We also have shorter courses for persons inspecting lasershows in live productions, for operators of laser show equipment, and for those advanced persons interested in doing audience scanning. Details on each course are listed below. The course material is specific to laser light shows, so these courses are NOT suitable for persons working with industrial, research, medical, scientific, etc. lasers. The safety information is useful in all countries. Material on specific regulations and laws only covers the United States. We have some yearly scheduled courses, and can also set up custom courses. 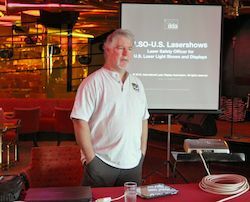 • Online LSO for Lasershows course, May 30, 2019, 10 am - approx. 5 pm New York time. $525 for ILDA Members or $649 for non-members. More info here. • We will probably have courses during the August 2019 SELEM meeting in Newton-Conover, North Carolina, during the LDI show approx. Nov. 18-21, 2019 in Las Vegas, and just before the ILDA Conference in late October-early November (site not yet set). • If other dates are added, we will list them here. • Custom courses are available in Orlando, Florida or at your location. Course rates depend on the number of persons taking the course at the same time. If outside of Orlando, rates would be higher to cover the instructor's travel and accommodations costs. • Online courses are available via Webex. Contact ILDA if you would like to take a course online. • Online LSO for Lasershows course, February 8, 2019, 10 am - approx. 5 pm New York time. $525 for ILDA Members or $649 for non-members. More info here. • We gave three classes just before the 2017 ILDA Conference in Bratislava. On Sunday, November 5 was the Laser Operator Class and the Advanced Audience Scanning Class. On Monday, November 6 was the Laser Safety Officer class. • We gave the Laser Operator Class and the Laser Safety Officer class at the 2017 LDI trade show in Las Vegas, November 15-16. • We did a custom course in Orlando on July 19, 2018 for three people. • Monday July 30 2018 starting at 7 pm Eastern (New York) time, going through to Tuesday July 31 at 3 am: This is the LSO course being taught online via Webex. The cost is $525. Register by going to the ILDA Event page. • August 8-9 2018 at the South Eastern Laser Enthusiasts Meeting in Newton-Conover, North Carolina. This is a great event so anyone wanting the ILDA LSO course at SELEM should also attend the main SELEM meeting as well. Register for the LSO course (only - we are not giving the operator or audience scanning course) at the ILDA Event page. • We did a custom course in Fort Lauderdale on August 10, 2018 for three people, and in Tampa on October 10 for four people. • We gave the Laser Operator Class and the Laser Safety Officer class at the 2018 LDI trade show in Las Vegas, October 16-17. • November 9-10 at the 2018 ILDA Conference in Montréal. The course includes a PowerPoint presentation with over 200 slides and a 70-page comprehensive printed summary/review. 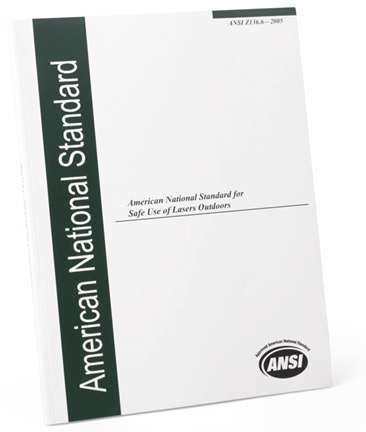 The course does NOT include copies of copyrighted standards such as those from ANSI, IEC or NEC. If you do not have these, you are urged to purchase them separately. Developer of the course is Greg Makhov, ILDA Safety Chair and instructor for LSO courses from other providers. 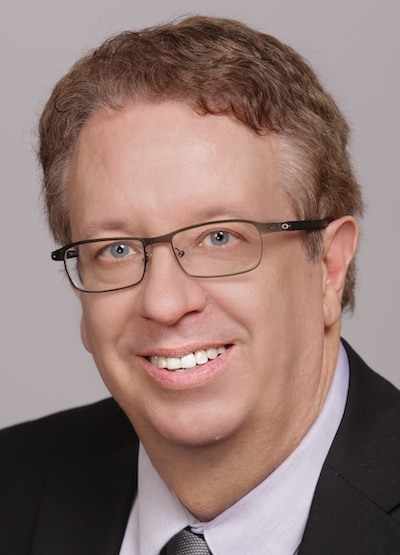 Instructor for the course, depending on availability, will be Makhov or Patrick Murphy, ILDA Executive Director and author of numerous papers on laser safety. 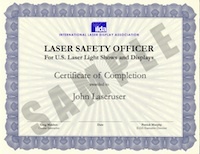 ILDA’s Laser Safety Officer - Lasershows course is ILDA's main laser safety course. It is for persons working in the field of laser light displays, who are responsible for the overall safety of a show. It comprehensively covers lasershow-specific content and safety requirements. We suggest that LSO - Lasershows students have real-world experience working with light show lasers, and/or have already taken ILDA’s Laser Operator Safety course. The course instruction takes about six hours, followed by a test which you have up to two hours to complete. • If you pass the test, you receive a Certificate of Completion stating that you attended the LSO - Lasershows course and passed the test. The certificate states that it is for U.S. laser light shows and displays, since the material about laws and regulations is U.S specific. • If you do not pass the test, you can re-take the course one subsequent time, within 12 months, at a lower fee. (The re-take fee amount varies depending on location.) Notify ILDA when you are ready to re-take the course. (g) IEC, ANSI and U.S. regulations. Regulatory requirements in non-U.S. countries may be discussed are not extensively covered. (k) Fire, ionizing radiation, cyrogenic hazards and other hazards as applicable. ILDA's course also meets Arizona state requirements for Laser Safety Officers. Specifically, Title 12, Chapter 1 of the Arizona Administrative Code lists in Appendix D three main areas which must be covered. Arizona's top laser regulator has told ILDA that applicants must train on subjects which are applicable to them. ILDA's course covers all areas applicable to laser light shows. Further, ILDA has been told that it is "sufficient if the registrant can supply the [Arizona Radiation Regulatory] Agency with documentation that the LSO has been taught in these subjects" and "show[s] proof of training in all subjects listed." ILDA's Certificate of Completion provides this proof to all who satisfactorily attend and complete the final course test. Finally, ILDA's course meets ANSI Z136.1 "Safe Use of Lasers" LSO training requirements in the areas applicable to laser light shows. Note that this is not a license. Also, it is not a requirement in most jurisdictions (Arizona excepted) that a LSO must supervise or run a laser show. However, LSO training helps a person understand the various risks of laser use, and how to keep employees and the public safe. 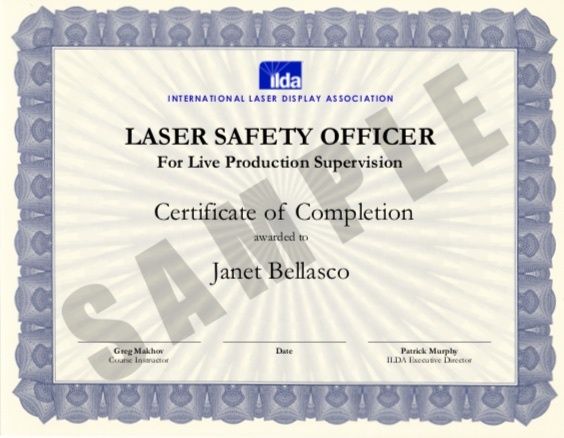 ILDA’s Lasershow Safety Inspector course is intended for persons working in live production environment, including concerts, theatrical productions, corporate shows, and special effects. The person is reviewing a laser light display created by another party, to help determine if the show is safe and legal. We suggest that Lasershow Safety Inspector students have real-world experience working with live productions. This course will tell you what the legal and safety requirements are for laser light displays, and what you need to look for to help ensure these requirements are met. • If you pass the test, you receive a Certificate of Completion stating that you attended the Lasershow Safety Inspector course and passed the test. Persons who take this course will NOT be qualified to independently take measurements to determine whether audience scanning is safe. This requires specialized equipment and knowledge which is covered in ILDA's Audience Scanning Safety course. 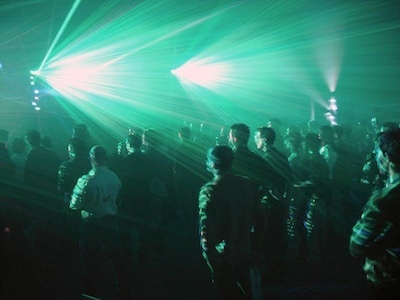 However, the Lasershow Safety Inspector course will discuss the basics of audience scanning safety, including the U.S. regulatory and documentation requirements which the laser show company must comply with. (2) Discussion of Illinois Title 32, Part 315 as it applies to entertainment laser shows. ILDA's Lasershow Safety Inspector course has been designed for persons who review the safety of laser show displays in live production environments. It applies to any location. Additional discussion is given to Illinois state requirements as they apply to entertainment laser shows. ILDA's course gives attendees basic training in the evaluation and control of laser hazards. Attendees will know basics of laser safety and will evaluate third-party laser show displays for safety and for legal compliance. Note that if there are detailed questions about the laser show displays, or if there are disagreements with the laser show display company, the course attendee may need to consult a person with more training and experience. This is similar to the Laser Safety Officer definition in ANSI Z136.1 which states,"The LSO either performs the stated task or ensures that the task is performed” (emphasis added). In this case, course attendees will either evaluate the display for safety and legal compliance, or will ensure that others with more experience do so if necessary. 6) Sketches showing the location of the laser systems, operators, performers, laser beam paths, viewing screens, walls, mirror balls and other reflective or diffusive surfaces that may be struck by the laser beam. (b) The operator shall also supply additional information as may be required by the Agency for the evaluation of the safety of the proposed laser light show. ILDA’s Laser Operator Safety course provides a basic overview of laser safety, for those who are operating laser show equipment, or are working around laser shows. It goes over laser safety basics and why it is important to follow procedures set up by the Laser Safety Officer. The course takes about four hours; there is no test at the end. Attendees receive a Certificate of Completion. ILDA’s Laser Operator Safety course covers how to do deliberate audience scanning legally in the U.S., and safely in any jurisdiction. It is an advanced class. Students should have already taken, and successfully passed, ILDA’s LSO - Lightshows course. If you have not, contact ILDA in advance to see if your prior experience and knowledge qualifies you for the class. Due to the course requirements, it is not taught online — it is only taught in person. Usually this is given once per year at the annual ILDA Conference. However, it may be given at other times/locations depending on the instructor's schedule, and can be given as a custom course as well. Top photo: October 17, 2018 LSO class at the LDI trade show in Las Vegas. Photo by Erin Collopy.